Animal manures are one of the most useful organic materials you can incorporate into the vegetable garden. Usually manures are fairly low in nutrients, but while the N.P.K. content of a nutrient source is an important factor, plant health and soil nutrition are not reliant on these alone. The value of any organic nutrient source should not be evaluated based only on these quantities. If you are buying bagged animal manures the N.P.K. values are usually displayed on the bag so you at least have some idea of its nutrient value. However if you are buying or obtaining bulk manures the only true way of determining the real N.P.K. value is to have it tested. The average vegetable gardener probably isn’t going to have this done so knowing how to evaluate what you are getting will help to determine a valuable product from a leached out nutrient poor one. Remembering of cause, as mentioned above, NPK is not the only reason for using animal manures in the garden. While there are many factors that determine the three major nutrient levels of animal manures the one that is lost the quickest and therefore can vary the most, is nitrogen. When looking for animal manures for the vegetable garden it pays to check the storage facilities at the source. Whether it is manure alone or manure and bedding material mixed it should never be stored outside and exposed to the weather. Treated like this it will decompose rapidly with the rain adding to valuable nutrient leaching. Manure is at it’s most valuable immediately after it is removed from the housing. The Nitrogen especially can be preserved if it is stored in an enclosed structure or in a deep covered pile. Much of the manure used for fertilizer is available from animals that are confined either inside or out will include bedding materials. These will vary depending on the animal manure being sort but those most commonly used include wood shavings, sawdust, peanut hulls, rice hulls, shredded sugar cane, straw. 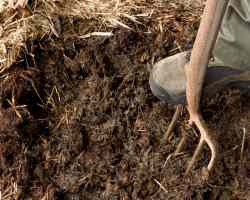 When getting bedding manures from anywhere take into consideration the bedding material type. Usually the finer the bedding particles the more absorbent it will be and more nutrients will be held before leaching out. Even bedding used for animals housed inside will eventually pass through the bedding and be lost. Sawdust and straw are two of the best nutrient absorbing bedding materials, however sawdust has the disadvantage of being a very high carbon bedding and very slow to breakdown either in the garden or compost heap. Application rates depend on the manure type, garden condition and application method. For more information go to the manure page concerned using the links below.